Next tour: Sat 18 May 2019. Meet: Travelshop, Piccadilly Gardens, 2pm. Calling all Ian Curtis/Joy Division fans. We meet hundreds of you every year aimlessly wandering around Manchester city centre looking for relevant locations: the Hacienda, Rafter’s, the Briton’s Protection …. If you came on our tour, you’d find out so much more, and we could relate all these places and their music stories with the history of the city while playing the relevant music at the appropriate sight/site. what more could you ask for? Rant over, here’s what we’ve got to say. 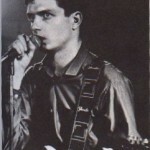 Ian Curtis. He was a tortured soul; a visceral, troubled mind with a voice that echoed Jim Morrison, Iggy Pop and Matt Monro. 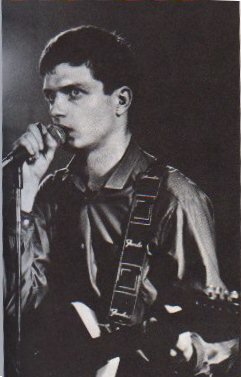 He led Joy Division, the finest flower of the early days at Manchester’s Factory Records, shaking sensibilities and sending shivers down the spine on an all too brief catalogue of classic works, epitomised by the Gogol-influenced “Dead Souls” and the harrowing “Shadowplay” in which he prefigured his own sad suicide. This is one of the more tragic tours in the NMW roster – but also one of the most powerful, heading into the very “centre of the city where all roads meet waiting for you”.